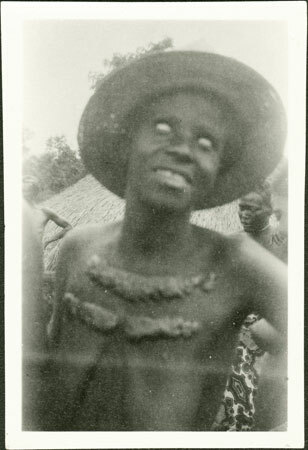 A woman with heavy cicatrisation on her chest making "eyes" as a joke during the ritual anointment of widows at the termination of their mourning period, when a feast is held. Since she is wearing a man's brimmed straw hat (kisikindi), she may well be comically acting out the new attentions of men towards the widows who are free to remarry. Morton, Chris. "playing a 'joke' at Zande widow ritual" Southern Sudan Project (in development). 03 Jan. 2006. Pitt Rivers Museum. <http://southernsudan.prm.ox.ac.uk/details/1998.341.299.2/>.